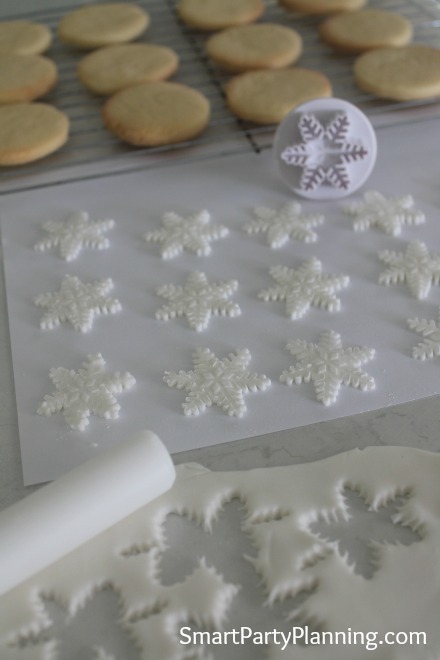 Inside: An easy snowflake cookie recipe. 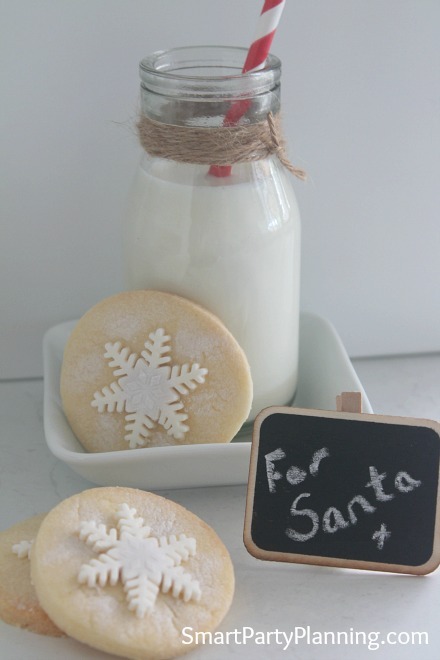 This is a delicious recipe that is perfect for Christmas, snow or a Frozen themed party. With a shortbread base and a fondant white snowflake on top, the whole family can enjoy them over the holidays. This is baking at it’s best. Shortbread is an absolute “must have” at Christmas and these easy snowflake cookies are so incredibly easy to make, it is bound to be a star treat for your Christmas celebrations. Originally I made these cookies for my daughter’s Frozen birthday party, but they are just too festive not to bring out at least once for Christmas. My daughter loves leaving out treats for Santa on Christmas Eve and milk and cookies are always going to be Santa’s favorite. Quite right too, because Santa does use up a lot of calories on Christmas Eve and he has to replace them somehow. These snowflake cookies are so tasty that I’m sure Santa could easily eat a small handful whilst putting the presents under the tree. The snowflake cookie recipe has a fondant snowflake perched on the top, which gives a lovely little dance on the taste buds. You will have to make them to see what I mean! They may look tricky, but trust me, they are SO easy. 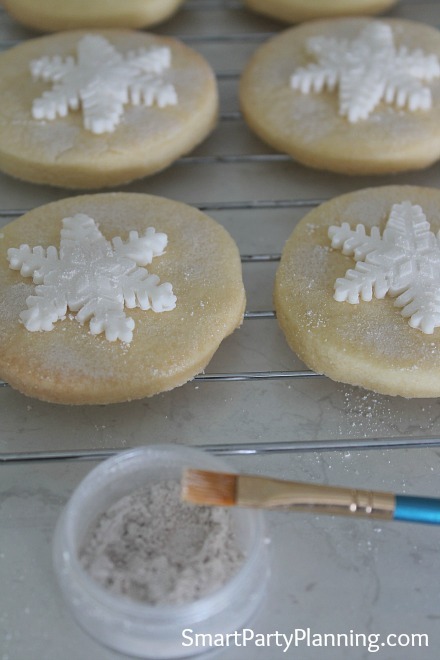 Step 1: Bake your shortbread cookies (using the snowflake cookie recipe below) and leave to cool. Once the cookies are cool you have the fun part of decorating! Step 2: Roll out your fondant and grab your fondant plunger cutter. You don’t want to make the fondant too thick, but likewise making it too thin will just make your stars limp. Cut each of your snowflakes and place aside. 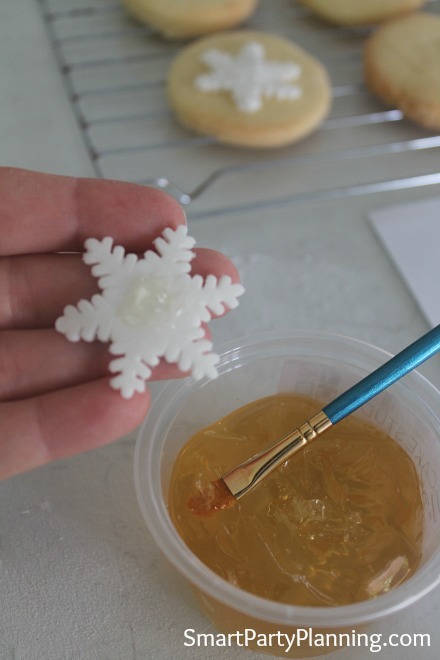 Step 3: Take a small paint brush and place a small drop of piping gel on the back of the snowflake, then glue down onto the middle of your cookie. Don’t worry about gluing the snowflake pointers; just the middle will be sufficient. Step 4: Adding the glitter dust! It is a good idea to leave the cookies aside to let the snowflakes stick before adding your glitter dust. But then, simply dust lightly over the entire cookie using a paintbrush. Step 5: Your cookies are now all ready to leave out for Santa (if they actually last that long). I mentioned earlier that I had previously made them for my daughter’s Frozen birthday party. Well here is a sneak preview of how they looked on the table. I think they worked perfectly and definitely suited the frozen theme. Rub in butter and flour using your fingertips until the crumbs form together. Using your fingers knead the mixture in a bowl until it clings together. Roll the dough to ¼ inch thick. 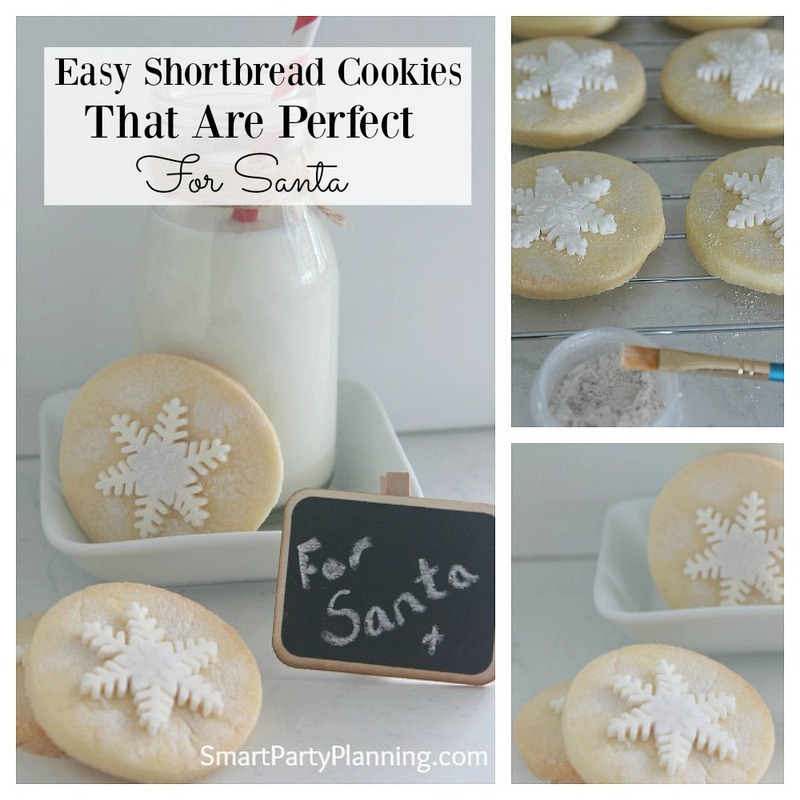 Cut into rounds using a cookie cutter and place on prepared baking tray. When set, cool on a rack. If you are intending on leaving some cookies out for Santa this Christmas eve, don’t forget to leave some food out for the reindeer’s too. I have a super cute FREE magical reindeer food tag to make life even easier for you. What food do you like to leave out for Santa? Let’s stay in touch. 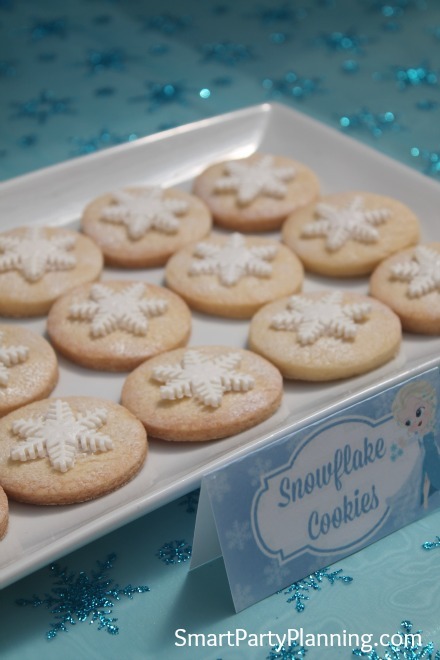 Do you love this easy snowflake cookie recipe? Sign up to the weekly newsletter to be kept up to date with other easy recipe and party ideas. You will also have access to a ton of free printable’s. Those are beautiful cookies. Almost too beautiful to eat. Great job on them! Um, yum! These are absolutely adorable! What a creative idea! Thanks so much for joining the Alder Collective this week again! Pinning!